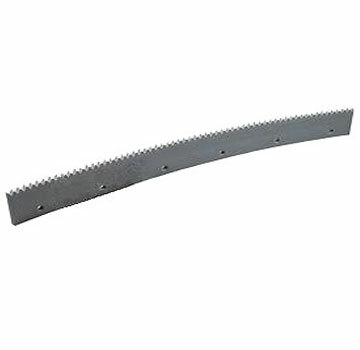 PRODUCT: 18 x 3/8 INCH SERRATED EDGE, GRAY EPDM RUBBER REPLACEMENT SQUEEGEE BLADES. PRICE/EACH. Fits most popular squeegee heads. Serrated edge for optimum control of material deposit. Pliancy of rubber blade allows flexibility of material thickness through pressure and angle applied. Rubber blade allows flexibility of material thickness through pressure and angle applied. OPTIONS: Other notches including 3/16, 1/4, 3/8 and 1/2 inch in widths of 16, 18, 24, 30 and 36 inches.